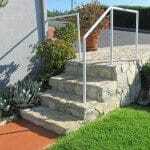 When stairs, steps and railings are not to code, what should you really look for? Check the metal railings, the underside welds and for cracks in the concrete steps. It's hard to believe, but over 90% of these do not meet current codes. Why is this?